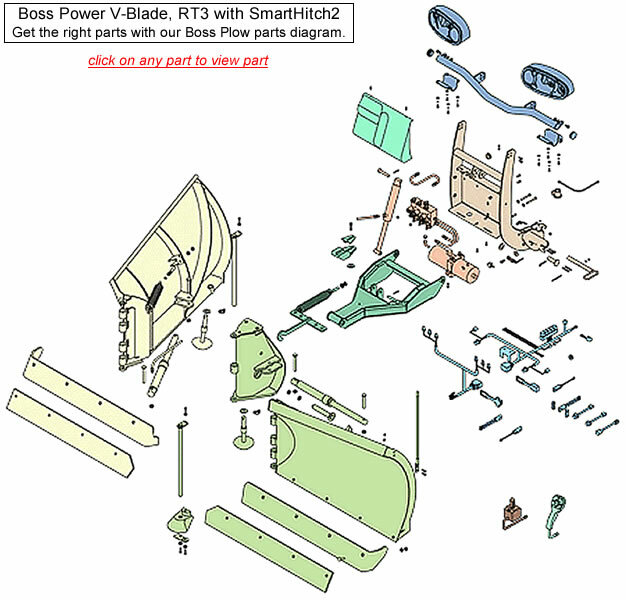 Buy Boss Snow Plow Power-V, RT3 with SmartHitch2 Parts by Part Look-Up Diagram. Boss Snow Plow Power-V Parts, Boss Power V-XT and Municipal Power-V Plow Parts Diagram. We carry a big inventory of Boss Snow Plow Parts, so your repair parts will ship out fast. We carry only Boss OEM Parts, so you can rest assure you are getting Boss Original Snow Plow Parts. Click on the Part Diagram of the Part you Need to Get the Right Part Fast. If you need another Boss Straight Blade Part, use your Back Arrow in your Browser to return to the Boss Straight Blade Part Diagram.